Update -- it looks like I got my wires crossed and this should actually be for next week. I'll leave it up here because it's already done, but just so you know, the links won't work until next week. Thanks (and sorry). 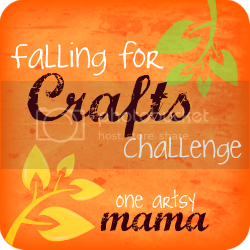 This is Week #1 of the "Falling for Crafts Challenge" hosted by One Artsy Mama (aka Amy). Every week she is going to give us some inspiration, along with a challenge. This week the challenge was "Centerpieces". I had some Indian corn leftover from making a Corn Husk Wreath (that you will see in the coming week or so), so I thought I would use those. I had pinned a centerpiece from Eddie Ross' site that I used as the starting point. I started by making sure that a corn husk hugged every piece of corn and tied a piece of twine around each one to make sure the husk stayed put. Next I put a large elastic around the candle so that I could slip in the corn cobs. I was only planning on doing this long enough to wrap the twine around, but the elastic became buried under the twine and you couldn't see it all, so I just left it. I did try to keep the twine and elastic at the same level so that later when I wrapped the entire piece, it would all blend in nicely. At this point, I wrapped the twine around maybe 6 or 8 times, tied it off and trimmed the ends. If I had planned on using this as part of a mantle display, I probably would have made some rustic-looking bow. Instead I decided to put it on our kitchen table so I left the bow off. Oh, the candle is a maple scent. Perfect for fall. Mmmmmmm. Be sure to pop on over to One Artsy Mama to see all of the gorgeous examples she has shown or maybe even to play along. Really pretty, perfect for Autumn. I have no idea where I'd find Indian corn here though - didn't even know what it was! Wow, that's so pretty! I can't wait to see your wreath! Aren't you clever? Love this. I just saw these little corns the other day at Hob Lob and didn't get any. Really can't wait to see the next wreath. I hope to post one tomorrow if I get the lead out today. :o) We're on holiday so I'm off work. Yay! Have a good one. Wow, you are all in with this fall thing. I'm going to be defiant until the first leaves fall dangit. I refuse to accept that it's September. Great Job Terry! Your house it going to look so cute for fall! Autumn is my favourable season. This corn decoration if perfect. What a pretty feel. I'll just say it, Terry... you are brilliant and on a real roll with your autumnal decorating! I love this idea and I can't wait to make my own. I'm getting some corn and going to be a copy cat!!!! Great idea! I love decorating for fall. I started a little earlier this year. I just couldn't wait! I love that idea for a centerpiece or even just on a table. Thanks for sharing at wow. That's perfect for the fall. I'm still in summer mode, but seeing this project kinda gets me in the mood for fall. Thanks for sharing at my Sizzle into Summer party. thats a great idea for fall decor. This is a terrific centerpiece and tutorial! Your candleholder is an absolutely sweet fall decoration. Thanks for the great directions with pictures. I plan on making one myself. Visiting from Savvy Southern Style link party. I want some corn now, what a cute easy way to decorate! This is so creative and looks great! Love the colors from the Indian Corn! Thank you for sharing! This is such a showy and creative display. So nice of you to share it! Thanks for linking to Potpourri Friday. Your participation makes the party more successful. I appreciate you! Thanks for linking up Girlfriend! Terry, this is so festive and colorful....love it! Really creative! I did not think that corn can be used as a design to some glassware. Did you color the corns intentionally?